Looking Back At The Rolling Stones, Live In Texas 1972 Nearly 40 years ago, The Rolling Stones decided to film four performances in Ft. Worth and Houston for a theatrical release. The finished film, Ladies and Gentlemen ... 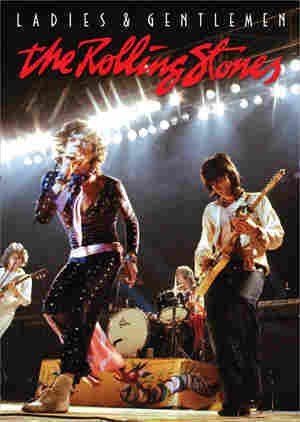 The Rolling Stones, has just been released on DVD. Critic Milo Miles reviews the performance. A still from Ladies and Gentlemen ... 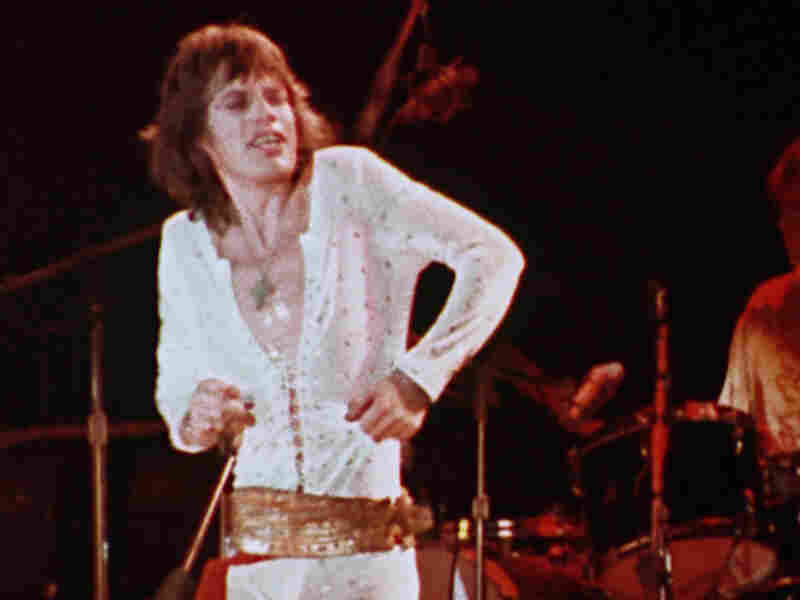 The Rolling Stones shows Mick Jagger performing in Texas in 1972. Of the films that feature The Rolling Stones in concert, there are two that matter. One is Gimme Shelter, but that Altamont documentary isn't really about the Stones, is it? The other one was more talked about than seen over the years, but you can finally enjoy Ladies and Gentlemen ... The Rolling Stones on your own flat-screen TV rather than in the hit-and-miss quadraphonic setup in which it was originally released in a few theaters. But wait — what about Martin Scorsese's 2008 Stones movie, Shine a Light, certainly the most cinematically rich documentary of the band? I think the difference between Ladies and Gentlemen and Shine a Light is captured in a moment before the music even starts. In Shine a Light, Bill and Hillary Clinton greet the band before the show — and, in fact, the two performances were a benefit for the ex-president's AIDS Foundation and a celebration of his 60th birthday. It's hard to get across what a scandal it would have been in 1972 if any high government official, let alone an ex-president, had such an intimate public connection with a Rolling Stones concert. Yes, presidents are more comfortable with rock 'n' roll these days, but the Stones are fundamentally transformed: They're not dangerous anymore. And all the fancy camera angles and inspired lighting and steely professionalism in Scorsese's movie can't make up for that. When Mick Jagger performs "Jumpin' Jack Flash" in Ladies and Gentlemen, he's not merely invoking a world-famous rock 'n' roll classic — he's incarnating it. Ladies and Gentlemen ... The Rolling Stones reflects an early-days concept of what a rock show should be — an almost punk-like spareness to the stage set, 15 songs in a punchy 82 minutes, and a furious, almost deranged set of final numbers. It's also clear by now that this was the most varied and cohesive set of players for the group — the sidemen were Bobby Keys on saxophone, Jim Price on horns and Nicky Hopkins on piano. But the crucial regular band member was guitarist Mick Taylor, looking like a pre-Raphaelite cherub dropped into a nest of gargoyles. Unlike his ultimate replacement, Ron Wood, Taylor did not sound or solo like Keith Richards — he was gritty enough, but also a subtle, lyrical bluesman. For The Rolling Stones, I think the most fundamental change of all since 1972 is that bluesmen aren't what they used to be. Once, the blues was the voice of outsiders who wouldn't sugarcoat love or tell you lies about work and success. Because the Stones were bold when they turned the language of blues-based rock to contemporary youth and events, they seemed like fearless, ravaged realists. But if the Stones never became aristocrats, they did become plutocrats and supreme show-biz insiders. The blues faded as a living music language, and though they tried and tried and searched everywhere, the Stones never found as durable a style as the blues to tell hard truths or at least deliver indelible threats like "Midnight Rambler." But in Ladies and Gentlemen ... The Rolling Stones, Mick, Keith and the boys were fluent in the blues like nobody else. For established pop-music icons, the Stones have been uncommonly reluctant to look back. By all accounts, the big impediment is Jagger, who feels the vintage material doesn't meet his standards. This release of Ladies and Gentlemen includes a new interview with Jagger in which he grants his seal of approval, saying the band sounds on and together. The cagey old codger is underselling a masterpiece.